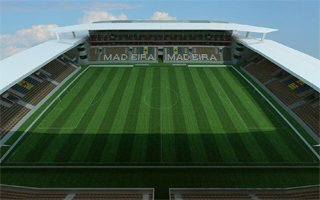 Decision to build a new stadium in the place of dated Estádio dos Barreiros was made back in 2006. Local architect and long-time Maritimo fan Pedro Araújo was awarded the design job. The challenge of this stadium lies in its location. Aside from Funchal being remote as part of Madeira, it also has undulated terrain. West side of the stadium is located higher than the east. It’s the west grandstand that will contain most of the infrastructure: offices, 42 skyboxes (12 seats each), small hotel, panoramic restaurant and a 170-vehicle underground car park. Remaining fans will have some 1,580 parking bays around the stadium for their cars. Groundbreaking took place in 2009 and construction was expected to last until 2010 even despite dividing works into two phases. The division was thought to enable Maritimo to play all their games here. While that last part worked despite leaving only the west stand and lower south curve (even in Europa League), trouble soon stopped construction anyway. Due to procedural issues with government funding work was halted in 2010, before first two stands were delivered. The €31.5 million project wasn’t restarted until May 2014. By the end of 2014 the first phase was done and construction of a third grandstand (south end) was underway. By March 2015 the old main grandstand was demolished too. Entire stadium should be ready in 2016, though structurally done in 2015. There’s a possibility it may prove cheaper than planned too (at €25 million), but as recently as last week new doubts were cast over public funding guarantees to finish the project after long 8 years.